Project materials can get expensive, and saving up old belts or using thrift shop finds is an inexpensive way to build a supply inventory. Find some DIY motivation below with these activities that incorporate recovered belts into useful pieces. Designer Inghua Ting has created beautifully installed flooring using tossed out men’s belts. First, any hardware is removed and the remaining leather pieces are cleaned by hand without using any chemicals. The leather surface is made by cutting the vintage belts into tiles and then adhering to the floor in a pattern or random application. They also make sturdy, one of a kind rugs. The designer points out that used leather belts make great surfaces for other areas also, like table tops and wall coverings. Her idea for staircases is stunning, as well as the practical side of utilizing them for things around the house, like placemats. Also, belts can easily be made into doormats. If you have an old chair that needs refurbished check out this tutorial for making a woven belt seat. Also, this lawn chair redo will have you scrimmaging to find old lawn furniture to upgrade with some high quality leather style. 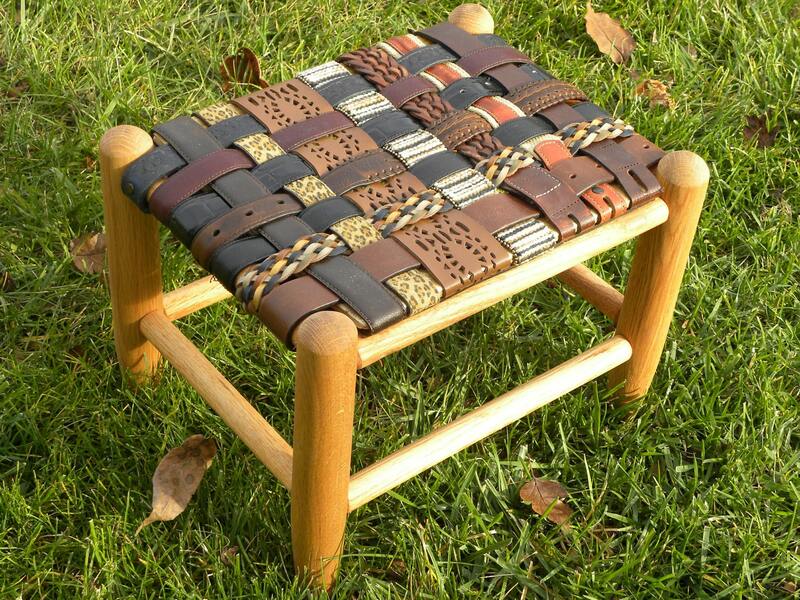 These footstools are another cool way to reuse belts. Cabinetry and hardware supplies are expensive. Belts make the perfect drawer pulls for furniture and add an instant distinctive uplift to dressers, desks, kitchen cabinets or wherever a knob or pull is needed. They are also useful for making straps for boxes, bags or purses that need new carrying handles. Need a picture frame or border idea? They are good for that, too. Belts are durable, easy to clean and shock absorbent, and can still be useful even after their fashion days are long over.